Galerie Lelong presents 14 striking new sculptures by Petah Coyne in Vermilion Fog, an exhibition divided into two parts—Dante’s Inferno and Unforgiven, allusions to literature and film that loosely frame the works by themes of loss, chaos, and redemption.Vermilion Fog is a monumental exhibition for the artist known for her use of diverse materials in large works whose grace and fragility belie their immense weight and arduous process. Vermilion Fog opens to the public on Friday, October 24 from 6 to 8 pm, and the artist will be present. 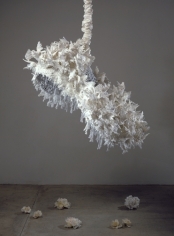 The 25-year career of Petah Coyne has been one of constant and pervasive reinvention—the reinvention of her own working practices, of unconventional materials and their innate characteristics, of the delineations of figuration and abstraction. 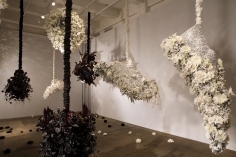 Coyne’s alchemic sensibilities have led her to adopt and interweave disparate and seemingly inflexible materials such as tree roots, sand, human hair, scrap metal, silk flowers, Velcro, religious statuary, and taxidermy. 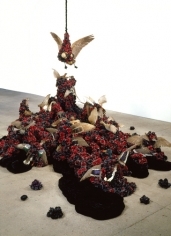 The labor-intensive works that result are both obsessively precise and wildly untamed. 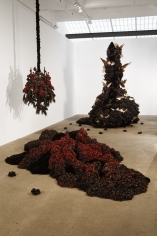 After all of her hoarding, hoisting, piling, wrestling, and encasing, Coyne’s creation is imbued with a restless energy that develops a life of its own. Coyne incorporates past practices and makes a sweeping, audacious leap forward in Vermilion Fog, a significant exhibition for the artist. 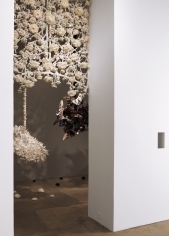 The narrative, hinted at in her previous sculptures, takes a more discernable form in the exhibition. Suspended in the air, sprawled on the floor, or winding skyward, the works appear frozen in time, halted. Tendrils dangling below or reaching out from the dense forms suggest decay, growth, and rebellion. 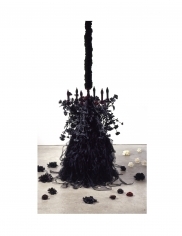 In Dante’s Inferno, Coyne creates a haunting and alluring netherworld, with large, undulating masses of wax-dipped flowers, velvet, and branches in dark, saturated colors. 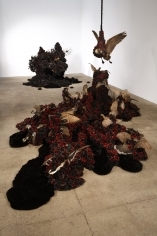 The 11-foot Untitled #1180 (Beatrice), the centerpiece of Dante’s Inferno, is a towering, perilous creature with whole taxidermy birds engulfed in its grasp. Stillness prevails in Unforgiven, where lush, rounded compositions of pale flowers and white doves represent a spiritual refuge. 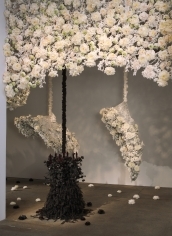 The artist envisions these suspended figures as souls ascending and descending, passing through the room. Exquisite, intricate gates of wax, flowers, and steel keep viewers at a distance from the works, emphasizing the sanctity of the space. 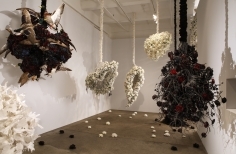 Unforgiven is a moving finale for the exhibition from Coyne, whose themes of regeneration and renewal echo her own persistence and ingenuity as an artist. 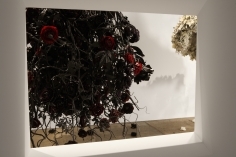 Concurrently with Vermilion Fog, Petah Coyne’s works can be seen in three museum exhibitions: 21: Contemporary Art at the Brooklyn Museum in New York; Damaged Romanticism: A Mirror of Modern Emotion at the Blaffer Gallery, University of Houston; and Time/Frame, Spencer Museum of Art at the University of Kansas in Lawrence. Her work will be on view in the Art Museum of Western Virginia’s new building for its permanent collection, opening this fall. Coyne is represented in numerous other museum collections, including the Metropolitan Museum of Art; Whitney Museum of American Art; Museum of Modern Art, New York; Guggenheim Museum, New York; Nasher Museum of Art; Corcoran Gallery of Art; and Museum of Contemporary Art Kiasma, Helsinki. A catalogue featuring the works in Vermilion Fog and texts by Ann Wilson Lloyd and Leslie Scalapino is available, published by Charta Books and Galerie Lelong.